Optional:Harness which powers HIDs directly from the battery, instead of factory wires. Recommended for best reliability. Diode Dynamics is pleased to offer the HYLUX HID Conversion Kit. After years of experience in the industry, we have assembled this kit, made up of the absolute best components on the market, to provide reliable operation at an OEM level of quality. Our warranty is through Diode Dynamics, LLC, so you can be assured that you will get fast and friendly service should you have any problems. 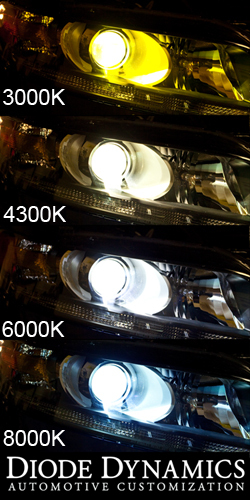 There is a full-replacement 3-year warranty on all HID Kit components, including HID Bulbs, Ballasts and Relay.